Vehicles in space now indicates targets in range on the crosshair. Added an option under Options->Gameplay to disable the crosshair dot when in relaxed mode. Restored the Auto Use Tool action to the Action Library. The Auto Use Tool animation is not triggered in inapplicable situations. Terminals now only play interaction animations and sounds when interacted with, and are only presented to the avatar who triggers the animation. Polished the appearance of the interaction interface while in cursor mode. Spacedust no longer has velocity or direction. Added an option under Options->Gameplay for “Left Mouse Buttons Interacts”. Right Mouse Button interaction is the default setting. Strafing while moving to a target no longer aborts interaction. It is now possible to rename a contact from the avatar name link. The Convert Shrapnel and Compact Inventory confirmation dialogs now have an option to “Don’t show again”. Increased the Distance Sensitivity maximum. Standardized many item names and naming conventions. To increase readability, most instances of roman numerals have been replaced by arabic numbers. 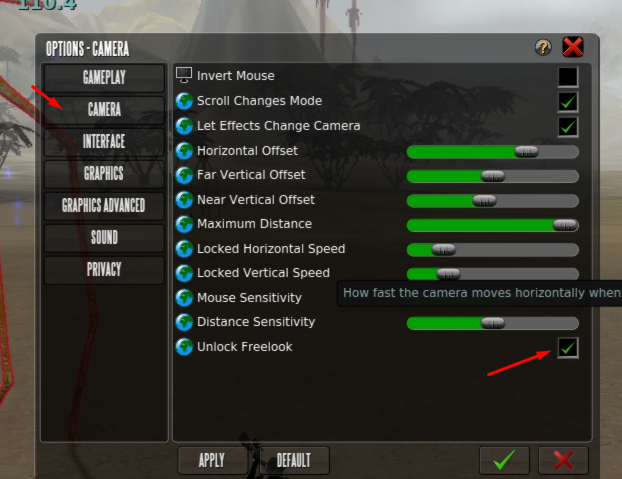 Added an option under Options->Camera to “Unlock Freelook” to cause the camera to ignore locked targets and interactions. The avatar will move in avatars direction. Lock Target is now cancelled when using the left and right mouse buttons to move. Containers now display their current and maximum item count and weight in their tooltip. Target marker indicators for next lockable targets that are outside the current camera view will now be displayed at the side of the screen. Added a News/Information window displayed after logging in, which will feature important news, event information, etc. Slightly increased the maximum zoom distance. Guest lists are now sorted alphabetically. Outlines should now conform to the models of targets when underwater. Fixed an issue causing the avatar to spin around unexpectedly when switching to vehicle gun turret seats. Fixed an issue affecting the Interact action when piloting a controlled creature. It is now possible to interact with and board Privateer ships in space. Corrected item type names for several refiners. Global animation effects (swirlies) have been restored to former glory, provided that those effects are not disabled under the Options menu. Fixed an issue causing items to sometimes become untradeable when using the Virtual Tycoon mobile app. Fixed an issue preventing the extraction of fuel from motherships while in Cursor mode. Fixed an issue causing the Interact action interface to sometimes result in getting stuck in Aim mode. Fixed an issue causing the Interact action to perform secondary action if the equipped tool is on cooldown and the Queue Use Tool action when reloading is not set. MindArk and the Planet Partners strive to ensure a smooth and problem-free Version Update. Nevertheless, even after extensive testing some issues may arise after release. Such issues are often addressed via mini-patches directly after a release and in subsequent patches. If you feel that the possibility of encountering minor issues or bugs directly after a Version Update affects your gameplay to an extent that Entropia Universe is not enjoyable, please wait until the mini-patches have been released and any last minute issues have been resolved. Only in virtual tycoon app? Problem was also ingame, with no link to the app. [*]Standardized many item names and naming conventions. To increase readability, most instances of roman numerals have been replaced by arabic numbers. inb4 the Romans begin to complain..
For News, Guides, And Events! Very good list of fixes, long time since i saw a well documented patch note. Is any 1 also having problems with looking up, down, right or left? all this camera change to return almost to the same starting configuration, nice loss of time. Nice can't wait to try! You created your account 2004-12-21.